Lisa Flam, an Associated Press Writer, has brought fashionable kippah wearing to the fore with her recent article "Yarmulkes for the Fashionable Faithful". In an article that could appear in a fashion magazine as much as it could in a religious publication, Flam explains that more stylish and offbeat options abound in addition to your grandfather's black satin yarmulke. The yarmulke as it's known in Yiddish, or kippa in Hebrew, is a headcovering "worn as a sign of respect to remind one always that God's presence is over us and as a sign of respect whenever we say a blessing," says Rabbi Joel Meyers, a leader of the Rabbinical Assembly, which represents rabbis in the Conservative Jewish movement. While the skullcap is among the most recognizable Jewish symbols, it is not sacred, which makes it acceptable to adorn it with sports logos or TV characters, says Meyers, who usually wears a knitted yarmulke. 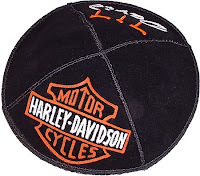 "The important thing is the wearing of the kippa, not what's on the kippa," Meyers said, recalling one given to him with a propeller he thinks signifies "spiritual uplift." 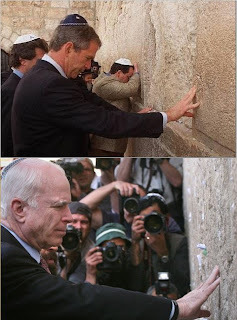 Proving that there has been a move to more stylish Jewish headcoverings, the presumptive Republican presidential nominee Senator John McCain last week sported a knit kippah at the Kotel (Western Wall) in Jerusalem. Compared to President Bush's choice of skullcaps, McCain's choice seems more modern and stylish. Perhaps that is attibutable to his loyal advisor and supporter (and Vice Presidential hopeful?) Senator Joe Lieberman. I have always enjoyed seeing celebrities don a yarmulke (especially non-Jewish celebrities like athletes and politicians). The first yarmulke I ever gave to a celebrity was in 1999 on the set of his movie "Little Nicky" when I presented Adam Sandler with a blue suede kippah with the Jewish Theological Seminary logo printed on it. I know I'm not the only one who enjoys seeing celebrities wearing yarmulkes, since, on their BangItOut website, brothers Seth and Isaac Galena have created an entire category of photographs called "Celebrity Kippah". The AP article described kippot featuring Dora the Explorer, the Miami Heat logo, and guitars. It also reported about a Jewish man who "has a blue seersucker yarmulke to match a blazer he likes to wear to Friday services." Of course, no matter how fun and creative yarmulkes get, there will always be those who prefer the "retro kippah" from a bygone era. Yes Its true and kippah use when performing a mitzvah, or commandment and its a tradition. Actually I have more collection of plain kippah ,Its my favorite comparing to a printed one. You're right, there's nothing wrong with wearing designed kippot and being stylish. What's important is still having your faith in your heart.